Virginia Beach is a rapidly growing city of more than 425,000 people. Sources of fresh water within the city, however, are limited. Prior to 1998, the Virginia Beach Public Utilities Department met the city's water needs by purchasing treated drinking water from the City of Norfolk. Because Norfolk had to meet its own requirements, the amount of water available to Virginia Beach was limited to about 30 million gallons per day (mgd) and even less during droughts. This water supply was supplemented with ground water from city-owned, community, and private wells. In many parts of the city, however, ground water cannot be used because of high concentrations of chloride, iron, and (or) sulfur, which give the water an unpleasant taste. In early 1998, a pipeline came on-line that can carry up to 45 mgd of water from Lake Gaston to Virginia Beach. The Gaston pipeline has alleviated concerns about water supply and quality for most residents living north of the "Green Line." These residents primarily use ground water only for small-scale domestic activities such as watering lawns, filling ponds and pools, and washing cars. City water and sewer services have been extended beyond the Green Line into the "Transition Area." Residents and businesses south of the Transition Area, however, continue to rely on ground water to meet most of their needs for potable and non-potable water. To help assure a continued, reliable supply of ground water, the U.S. Geological Survey (USGS), in cooperation with the City of Virginia Beach Public Utilities Department, has begun an assessment of the shallow ground-water resources underlying the City of Virginia Beach. The City of Virginia Beach showing the Green Line and Transition Area. 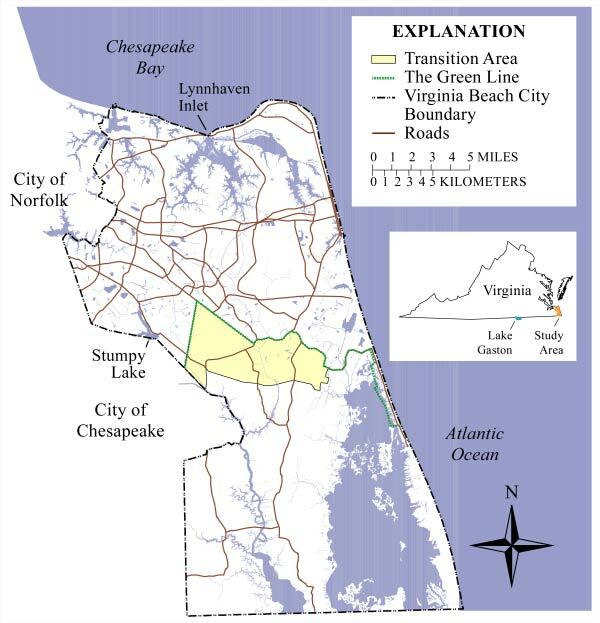 The Green Line is a geo-political boundary imposed by the Planning Commission and City Council in an attempt to preserve the rural nature of South Virginia Beach. It marks the northern boundary of the Transition Area between the urbanized north and the rural south. "Destination development," such as sports complexes, golf courses, and parks is encouraged in the Transition Area along with limited residential development. City water (mostly surface water) is available in parts of the Transition Area, but this likely will be supplemented with ground water. South Virginia Beach is the portion of the city below the Transition Area. It consists of the Boroughs of Pungo, Blackwater, and the part of Princess Anne between Indian River Road, West Neck Creek, and North Landing River. In 1996, the population of this area was estimated at 5,100 (City of Virginia Beach Department of Planning, 1996). Agriculture dominates the economy of South Virginia Beach. In 1996, the value of agricultural products from this region exceeded $21 million and the estimated contribution to the Virginia Beach economy exceeded $70 million (City of Virginia Beach Department of Economic Development, 1997). Major crops include corn, soybeans, wheat, barley, potatoes, strawberries, sweet corn, beans, sweet potatoes, tomatoes, and watermelon. Hog farms, commercial horse facilities, and a variety of businesses related to outdoor recreation also contribute to the economy of South Virginia Beach. 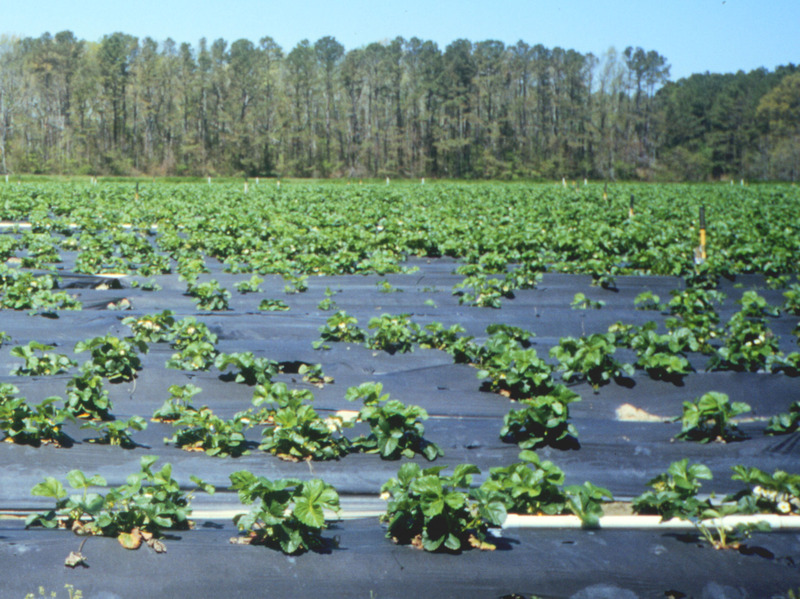 Strawberry field in South Virginia Beach using drip irrigation and a plasticulture system, techniques designed to improve crop quality and minimize water use. At least 380,000 gallons per day are withdrawn from the shallow aquifer system in South Virginia Beach. This is a conservative estimate, accounting only for water withdrawn for domestic supply and assuming each person uses 75 gallons per day. Domestic supply accounts for most of the ground-water use in South Virginia Beach. The only crops that are irrigated extensively are strawberries, tomatoes, and, occasionally, sweet corn. Farmers rely on precipitation and a system of runoff collection and retention ditches to provide sufficient water for the other major crops. Ground-water withdrawals are expected to increase, however, if the trend of converting farmland to low-density housing continues and as more farmers shift from growing grains and soybeans to growing fruits and vegetables. An increase in irrigation likely will accompany the shift in crops as fruit and vegetable growers attempt to ensure the quality of their products to maximize their market value. Virginia Beach north of and including the Transition Area is highly urbanized and has a population of nearly 420,000. Tourism, military operations, retail and wholesale trade, and light industry constitute the economy of this region. Ground water is used in North Virginia Beach primarily to meet non-potable water needs, the largest being irrigation. A few communities, however, still use ground water for their primary drinking water supply. Although the ground-water system extends to more than 1,000 feet beneath the city, water from all but the upper 100-200 feet of it is too saline for consumption. In some parts of Virginia Beach, high salt content (measured as chloride) is a problem even at these shallow depths. Chloride concentrations exceeding the EPA secondary drinking water standard of 250 mg/L have been found in the areas adjacent to Lynnhaven Bay, around Stumpy Lake, along Holland Road, and adjacent to West Neck Creek. Chloride is not the only ground-water quality problem in Virginia Beach. High concentrations of dissolved iron and sulfur are a widespread problem throughout the city, making it necessary to treat the water prior to consumption. 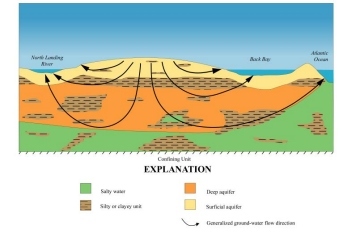 Conceptual sketch of the Virginia Beach shallow aquifer system. Over the next three years, the USGS will be working to characterize the shallow aquifer system underlying the City of Virginia Beach. 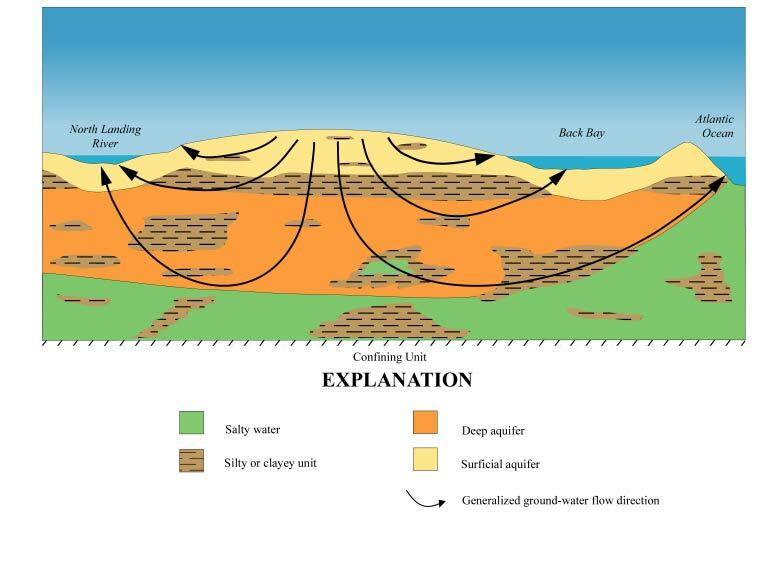 This is the first attempt to characterize and understand the dynamics of the aquifer system as a whole. The study will provide a better understanding of the distribution of fresh ground water, its potential for development, and its susceptibility to contamination. In addition, baseline conditions for summer low water levels will be established using a network of observation wells. The results of this study will be helpful to a variety of public and private groups. The Public Utilities Department will be able to use the results to plan for the city's water needs and to preserve freshwater supplies for emergencies. City planners will find information from this study helpful as they update the Comprehensive Plan and evaluate zoning changes. Consultants can use the results to assist in siting production wells for their clients, in writing permit applications for ground-water withdrawals, and when undertaking ground-water remediation projects. The Virginia Department of Environmental Quality will be able to use information from this study to make more informed decisions in granting permits to users of large amounts of ground water. 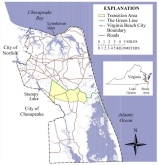 USGS scientists will use the results of this study in an updated model of the Virginia Coastal Plain aquifer system (McFarland, 1998) and in their study of the effects of the Chesapeake Bay impact crater (Powars and Bruce, 1999) on the ground-water systems adjacent to and within the crater. City of Virginia Beach Department of Economic Development, 1997, 1997 data sheet, 4 p.
City of Virginia Beach Department of Planning, 1996, Statistical and development information package, January 1, 1996, 117 p.
McFarland, E.R., 1998, Design, revisions, and considerations for continued use of a ground-water-flow model of the Coastal Plain aquifer system in Virginia, U.S. Geological Survey Water Resources Investigations Report 98-4085, 49 p.
Powars, D.S., and Bruce, T.S., 1999, The effects of the Chesapeake Bay impact crater on the geological framework and correlation of hydrogeologic units of the lower York-James Peninsula, Virginia: U.S. Geological Survey Professional Paper 1612, 82 p., 9 pl.